Norbury Lake Provincial Park (97 hectares) is located just southeast of Fort Steele and provides the visitor with 46 seasonal lakeside campsites, good beaches and walking trails. Canoeing is a good way to explore either Norbury Lake or Peckham's Lake where rainbow trout are abundant. Powerboats are prohibited. To the east of the park are the Steeples in the Hughes range of the Rocky Mountains. Elk, deer, and Rocky Mountain Bighorn sheep may be seen in the area, especially during winter months. The Columbian ground squirrel and other members of the squirrel family can be seen within the park. 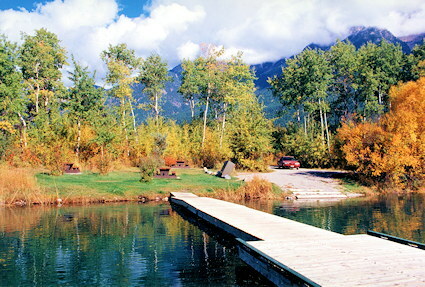 To reach Norbury Lake Provincial Park, travel 18 km. north from Hwy 3 or 16 km south from Hwy 93/95 near Fort Steele.